Mayor Mike Bloomberg's capital budget, released Thursday, includes $205 million designated for Atlantic Yards--a sum far greater than the $100 million formally pledged. I asked the mayor's press office early yesterday morning for details, but did not get a response by the end of the day. One explanation may be that the city is relying on a vague clause in a 2005 Memorandum of Understanding to steer more city funds to the project. 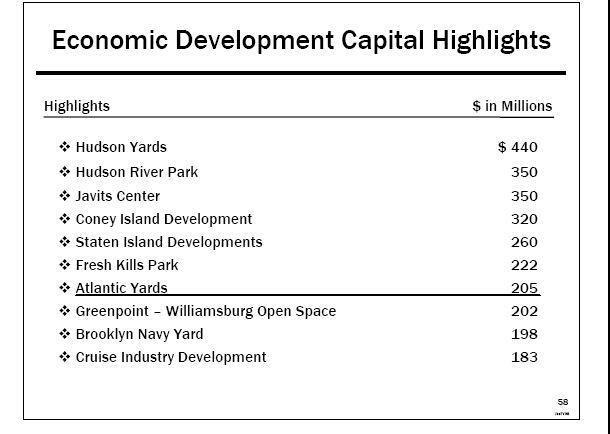 If so, that opens the door for even more city contributions in the future--a potential Atlantic Yards slush fund. If not, could the city's capital budget somehow have included the $100 million in state funds also pledged to the project? In the MOU signed 2/18/05 by the city, the Empire State Development Corporation (ESDC), and developer Forest City Ratner Companies (FCRC), the city agreed to contribute $100 million, as did the state. The city's portion could be used for site preparation and public infrastructure improvements on and around the arena site, and also for a portion of the costs of the acquisition of the arena site. A curious clause in the MOU, however, left the door open for further contribution. It states that "Public Parties will consider making additional contributions for extraordinary infrastructure costs relating to the mixed use development on the Project Site (excluding the Arena Building Site)." Is that additional $105 million for "extraordinary infrastructure"? 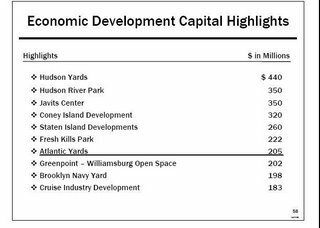 Develop Don't Destroy Brooklyn has regularly pointed to the potential for uncapped "extraordinary infrastructure" costs. If so, how much will the city pay? And how would that factor into the cost-benefit analyses that have consistently, if diminishingly, painted the project as a fiscal plus? Maybe there's another explanation for $205 million sum, such as a commingling of state funds. (Even so, that would push the commitment over the $200 million mark, albeit by only $5 million.) The city owes the public some details.